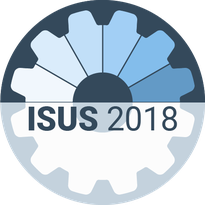 In order to participate in the ISUS 2018 conference you need to register by filling out the form on the registration page which is linked below. You will also have to pay the corresponding conference fee. The conference fee includes participation, conference materials, all coffee breaks, sweets and snacks at the conference venue and lunch at the university mensa (with several vegetarian or vegan options) during the conference. The regular conference fee for full-time academics (or equivalent) is 150 €. There is also a discounted conference fee available for students. The discounted conference fee is 100 €. The fee for the optional conference dinner on Thursday, July 26 is 25 € (this is heavily subsidised, using external funding, to allow many people to attend). The conference dinner will be held at the ZKM art centre and involve, among other things, food inspired by Bentham's prison cook book and an art installation by Daniel Heiss. It is not possible to book additional spaces for partners or friends you might want to bring along on the website; of course this is possible (the rate would be 50€), but please send us an email in that case. The conference fee needs to be paid via credit card - if you do not have a credit card or want to pay by bank transfer please contact us. Please register by July, 3. After that date, we cannot guarantee you a space at the conference dinner. To open the registration page, please click here. the summer school is only open to students who have gone through the application process which took place in March 2018. You may only register if you have been accepted then! Anybody interested is welcome to register for the conference.